We specialize in showcasing the finest foods of Mexico. Our family recipes were handed down over generations and include select cuts of meats, and choice seafood alongside season fresh vegetables. Our chefs prepare our dishes to render traditional tastes, with fresh flavors in every bite. We have a dedicated full bar area where we serve mixed cocktails, imported and domestic beers and our legendary and famous Margaritas. 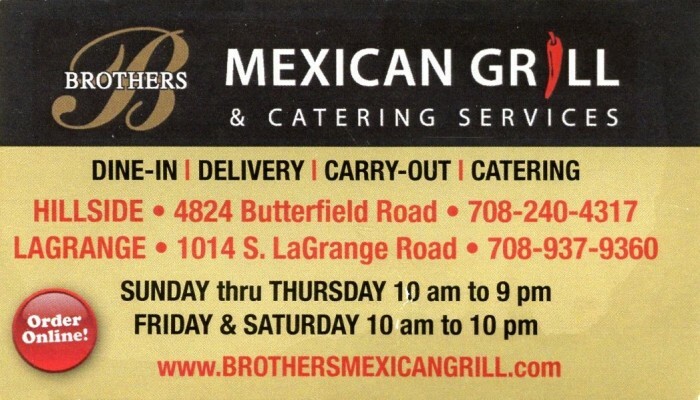 Formerly Panchos, Brothers Mexican Grill & Brothers Signature Catering reopening in late 2015 in the heart of the Chicago Suburb, Hillside IL, near Oak Brook. The restaurant is still family owned and operated.